A fashion media professional, avid blogger, founder and executive producer of the television series Designing Africa, with her hit campaign, 100 Days of African Fashion, Diana Opoti is a champion of the continent’s fashion design market, growing to become one of the Africa’s most formidable fashion connectors. 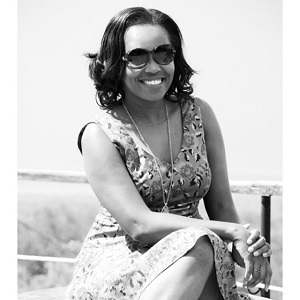 In 2014 Diana Opoti was nominated as “Outstanding Trend Communicator of the Year” by The Africa Fashion Awards. Diana Opoti, so thrilled that you’re here sharing hope with me and so many others listening with me today. If I get this right, you’re way, way into the fashion profession. So, you’ve really promoted African fashion and in fact you’ve been named one of the most outstanding, I think actually, the outstanding trend communicator of the year by the continent’s most prestigious award in South Africa, the African Fashion Award. So, you’ve also done this thing called 100 Days of African Fashion, I want to hear about that in a few minutes as well and you’re promoting African Fashion not just because you’re a wonderful designer and promoter, but because you actually have a passion for what’s going on in you continent and your country, Kenya and so many others around you. In Nairobi now, tell me what you’re doing today and then a little more about you and I’ll jump into these five questions about hope and I’d love to hear your answers. I guess we can start at the background of why we did 100 Days of African Fashion. There are just so many designers coming up and I realized that if you were not in the fashion industry, not only did you not know of these designs but the outlets are really few and far apart. So, to access Nigerian fashion for example, you would basically have to be in Nigeria or a contact of the designer in your city. If you were lucky, you would have some of those pieces. I wanted to just create an awareness of African fashion. This followed a TV show that I created called Designing Africa. I traveled across the continent and interviewed young designers just to understand what African fashion was. A lot of the times, three or four years ago, a lot of the times we had African fashion, it was about cultural references. I wanted to discover who the young designers were, what their aesthetics were and to show people that just like global fashion, African fashion really varies in aesthetics. That is the background of 100 days and why we started it. My batter is really low and there’s no power – let me just walk with you as I speak. The other thing as well is 100 Days for me was just a bit of a protest in terms of I wanted people to understand that these clothes were accessible. I wanted them to see how they could apply them on a day to day. So, 100 Days was not about red carpet outfit, 100 days was about good quality African outfit. That’s why I did the 100 Days campaign. Just a clarification, I didn’t win at the awards, but I was a shortlist nominee. I was one of the top three and then somebody else won at the Mercedes Benz Africa Fashion Award. Well, you should have won. Everybody that’s listening with me, I wish you could see what I’m seeing right now. So, we’re on Skype video chatting and Diana’s beautiful, you’ll see pictures of her online. She’s just fantastic and the power is out at her house right now and she’s still beautiful and she’s walking around with her cellphone to make sure we get to do this conversation and she’s all dressed up. She looks fantastic. I tell you what, if the power was out near my town everybody around here would be like, “ugh, I couldn’t wash my hair, I couldn’t get the blow dryer to work, I couldn’t get anything done”…. We did have power just a couple of hours ago, so it’s not that bad. Thank you for all the extra effort you’re having go through today to make this work. I really appreciate it. All right Diana, here’s how we do this. We ask five questions for every person we talk to. So, we’re interviewing 1000 people around the world to get as much of a true connection to hope globally that we can, asking people in every genre of life. Every 8 million people represented in a people group around the world, no matter what people group that could be, it gets one representative on the survey. Obviously, you’re in a unique location in the world being in Kenya, you’re a fashion designer and consultant, you’re a woman, you have a story that’s really compelling and you’re doing a lot to engage the community in hope. I can’t think of a better person to talk to and ask these questions. So again, let me jump in and I just can’t wait to hear what you have to say. Question 1: What’s your favorite quote about hope or your definition of hope? Hope for me is looking forward to what we don’t know, but we want to believe in. That’s what I see hope as. When I started, for example, the campaign, I had no idea where it would take my personal brand. Hope is the belief that things could be what you want them to be if you dream and work towards it. Wow, that’s’ powerful. It really is. So with that definition in mind, question 2. Question 2: Who has shared the most of that kind of hope with you? Who’s given you a lot of that hope? I must say that – especially in the regard to the campaign that I’m running, 100 Days of African Fashion and how it evolved to then see me set up a fashion consultancy for African fashion brands looking to enter Nairobi or Kenya, I would say it was the immense support from all the designers. I had no background, I wasn’t being supported by a big company, there was no promise for visibility beyond my own personal network yet designers from across the world of African heritage and across the continent sent me outfits and so I did fulfill 100 Days and I even have much more. So, just the support for people to see this happen, for me, is part of that hope of what Africa could be and that unification and the spirit of oneness. These are people from all over Africa, not just your country, right? Yes. I profiled maybe +100 unique brands across the 100 Days, so I got designers from South Africa, Nigeria, Lagos, even Sierra Leone at the time. I’ve got a couple of designers from Congo, from Cameroon and the second addition of the season is coming up and people are already writing asking to be profiled. It’s Kenya, Africa and then also African designers who are living in the United States, in the United Kingdom and even Australia. So, just the hope that yes, the African consumer can sustain African fashion businesses and African fashion brands are buyable and that we can change the attitude about local manufacturing or support local brands. Wonderful. Wonderful idea. I know that can go even farther than your shores in Africa because I see African brands and African trends springing up more and more here in the US. I think it’s great. I love the global feel of that and I love that somebody like you is taking those groups and those people that may not have thought otherwise politically or religiously for their place in their society and you’re actually just using fashion, the stuff that we all think about, to make that connection not only in your own country, but you’re getting it outside of even African borders. That’s really cool. Yes and thank God for the internet, right? Absolutely, like right now, internet is great. Question 3: Tell me a time when hope was something you really had to fall back on. Kind of paint the picture. What was going on in your life when it was just really hard and you had to make some tough choices and had to pursue the hope that you knew you had and it was right? Take us there. About five or six years ago, my mom passed away and I was in my second or third year of university or just going into my third year of university. I was on my own and all my siblings were out of the country and I started dating this guy. It became an abusive, obsessive relationship and it took a lot for me to get out of that. Even when I did, because it was really difficult, when I did pull away from the relationship I was stammering, I was very afraid, I had no confidence. A friend of mine asked me to come for a TV interview which then became my first TV job as a TV host. I’m not even sure why I was selected for it, but I wanted it so badly that I had to work towards keeping it. I remember the transition between picking myself up, I mean leaving that relationship and picking myself up and having to interact with people and sharing things with friends. It was a really difficult period for me coming out of it. My work helped me come out of it and become a normal person again. That’s a great example of something that can really drain the life out of you with the wrong kind of relationship and many others get in that spot. How did you, just practically speaking for people listening, how did you get yourself out of that relationship in a healthy way? I wouldn’t really say it was a healthy way. I tried to maybe six times and I kept going back because most abusers will hide behind alcohol or anger so he always won me back, he always managed to get me back into the relationship. One day, we’d gone out clubbing and when I came back home, he was really violent and the next morning I just woke up and decided I’m going to walk away from this house. I didn’t take any of my clothes, I didn’t take any of my jewelry or anything that invested in the house. I just walked to the office with my handbag and the clothes on me and then that evening I went to an uncle’s house and then I never looked back again. I’m not sure what gave me that strength that day, perhaps it was the fear of what could have happened if I had really been hurt because he really hit my head against the wall and he stripped me in front of the guards. I felt that it was just that turning point. I guess I just snapped. I’ve taken in so much and I just snapped and decided I wasn’t going to go back. I changed my phone number, I stopped going out, I changed a lot about my social life. It was not healthy for me, but it was the only thing that helped me get out of the relationship and not go back. Prior to that, I had been out of the house, I had been back and forth in that relationship maybe six times and I never had the strength to move one – not when he was abusive, not when he second guessed everything that I said, not when he was mean and offensive, but that one time when I was hit really hard, I woke up the next morning and decided I’m not going to stay here and I didn’t. For me, that was my turning point. Great story and a lot of courage. Congratulations on your way over there. That’s a big deal. It’s really hard to walk away from an abusive relationship. I know that. I know that personally and I know it through other stories as well and your bravery impresses me. Thank you. Good example there to for myself and all the people like me listening to you right now. Just that important process of finding where you need to take action and taking the brave step of doing something that you think, well I’m going to lose other relationships, it’s not just the one relationship with the abuser – it’s all the other relationships you are, I’m sure thinking about. What about their friends or and the people that might take his side versus my side and all the places that he goes that I still want to go maybe and can’t go now. There’s all those things, but it’s the clean break that really – you changed the lifestyle, not just the person, you know? Yes. You change a lot about yourself, but you also second guess a lot about your decisions. I wasn’t with him for his money. I had a stable job, a well-paying job. I lived that life for a long time because I was in that relationship for 1-1/2 years and maybe for about six months it wasn’t in the list. There’s nothing about the first six months of that friendship that was violent, however there were small signs that people say we should always watch out for in terms of that obsessive personality type. The thing about leaving in abusive relationship in a middle class setting is it’s not perceived normal, so many women don’t talk about it, so your whole life is a lie. A lot of your friends, you don’t want to tell them because you know that they’ll ask you not to stay in that relationship, but you feel that something is holding you back that’s why you are not able to move forward. For a long time, I didn’t tell anybody and when I did talk about it, it wasn’t a save that could save me, so it became critical. Most times like in my case especially, he found a way to cut me off my friends and make me dependent on him emotionally and I guess that’s what he was looking for in me. A very important thing that I learned later was I knew two other women who had dated him and have gone through the same thing and none of us every spoke about it. Stumbling on that information made me so aware that the things we hold back could actually impact somebody else’s life because we’re lucky that none of us died or were badly injured or scarred. But, if we spoke about it and people knew that he was that way, maybe the second or the third person would have not gone through the same thing. You are right. You are right and you are encouraging me to do the same and not hide what goes on in our past that we may feel shame or embarrassment about, but if it comes out and it’s the truth and you can help somebody else see a better way to do things or a danger to stay away from. What a great opportunity. You never know, the person who is struggling with the bad habit, the anger, the abusive tendency, sometimes they can actually get help and find a way out of that pattern and that’s a great thing too that may come from the honesty. You can’t be the one to walk through that with them. You need to get away yourself, but you can actually – in the process maybe they’ll find a way to work on their own stuff. Nice. Thank you. That’s hard to share, but it’s really good. There’s a lot of hope in that and there’s a lot of good pathway to follow there. I know we have the 100 Project that’s going on where you’re collecting so many things from the continent, the deal with fashion and sharing those brands and those ideas. But in a daily way, as a “regular person” like me and the rest of our listeners, how are you just going around in your community and your family, your friends, how do you share hope with people? I know a lot of people do a lot of mentor-ship talks and various things, but you’ll be surprised how involving and overwhelming it is running this project. I try to create a balance between introducing a new brand and exposing them. I don’t judge designers to prop out all their clothes because I run a fashion PR consultancy that is in independent of this work. So, it’s a balance between understanding the power of my voice in terms of introducing new brands whether it is introducing new bloggers as to directing people to walk with them. It’s all the small aspects that I try to combine with my work. That’s really how, right now, I’m trying to share the space with people, so that’s where I guess. Okay. That’s great. That makes sense. In your own job, in your process, it’s not just about the 100 Days, but there’s so many other things. You have another business that actually helps with what you’re doing and it’s the way you make a living. There’s a lot of projects and a lot of people there you are able to share hope with just on your regular, daily work if I’m hearing you right. You cut out just a little bit there, so I’m just making sure we’re talking the same thing. Is that right? Yes. Absolutely. I professionally run a Fashion PR Consultancy which has a mix of services including market research, fashion recruitment for personnel and that kind of thing. It creates the real link between – for business, from a business perspective, your brand can grow or you can connect with traders because that really is what happens with 100 Days. Yes, that’s right. That makes sense. Great. Question 5: Tell me some simple steps of hope. How can we just learn and take some simple steps, the 1, 2, 3s to move forward in becoming people of hope or sharing hope with somebody else. What is the first thing we should do right now? If I’m going to hang up for this phone call and get to it, what do I need to do first to start sharing hope? I always say that even for what I do, which sounds very big, right, sometimes, the first and most important thing is for people to just genuinely believe in something. Look on one thing and believe in it. So, that’s for me what’s important – that we find something that we believe in because that becomes the easiest thing for you to market. For me, I love fashion and then I found a purpose in fashion. All those skills that I’ve learned from TV production to public relations, I combined them with my natural skills and then this is what came out of it. I think the first step would be to discover this one thing that you’re interested in and then to study and learn it and see how it can impact other people because the most important thing for me has been the happiness of other people. My company is driven by sharing. I will wear a beautiful item, but whatever I’m wearing gives visibility to the designer who made it. So for me, that’s my direct way of integrating what it is in terms of how I found hope. For me, it’s sharing that hope with people and seeing how to transfer my happiness to people with everything that I’m doing for the company. Great. Really good. Really good. So, you’ve given us so many things to think through. So many things from your own story and then also just steps of hope moving forward and you’re accomplishing a lot in your area of, not just industry, but your area of the world. I’m really impressed Diana, I really am. I don’t know how you have enough energy to get all this done. Thank you Chris. Sometimes I don’t even realize it because also comes a lot of challenges monetizing this campaign – it’s not easy. So, it generally will benefit from the goodwill of designers without it being a pity project or a charitable project. It’s not a charity project. I am very fortunate that I was able to even see very clearly the areas to keep it commercialized which is the separate entity which is the fashion PR business. That’s what I wanted to say, that it’s not easy. A lot of people look at me and say, “Oh, you must have an impressive wardrobe”. I’m 31 and I think it’s not traditional – most bloggers are under 30 and they’re getting even younger, so it’s not easy having such a public life, if you can say that, especially because there’s always that confusion. A lot of people, professionally, might not understand what I do because they only see you and the clothes that you wear, if you know what I mean. Right? Right. I’ve heard that many times before. The passion that you have and what you love to do becomes the – if you can figure that out and find a way to make that thing become the thing you can do all the time, there’s not much that can stop you. Diana Opoti, wonderful talking to you. How would you describe yourself? If you had to say this is what I really do, what is it? I connect fashion brands to consumers. I create visibility for other fashion designers. Are you travelling around Africa or are you staying in Kenya, in the Nairobi area and bringing these things in? Do you actually get to go to a lot of these locations and meet the people who are designing these pieces? Yes. I have two things. I produce a fashion television series called Designing Africa, so I travel across the continent to different African cities for top fashion events, so I do get to meet these designers. In fact, many of them are personal friends of mine now. That’s one on one hand, the other thing I do is I’m also based in Nairobi, so the positioning for my brand really is the fact that I can connect brands to…The things is I can connect brands who want to come into the market with local clientele. My positioning is really in Nairobi. I have contacts in Lagos, I have contacts in other African cities, so those designers from those countries who want to come in, I sort of build what my client’s knowledge is, so I am able to guide those brands in my own city. For 100 Days, I am based in Nairobi and everything is centralized here. Everything comes back here. This is for my own curiosity. Your favorite piece of music, favorite song, artist, whatever. What are you going to pop in, put your headphones in and you want to feel a little better get a little more sunshine or hope back in your life, what are you going to listen to? Anybody. Anybody? So right now, I am doing a campaign with this amazing guy called Zwai Bala from South Africa and he and his brothers have such amazing voices. That’s what I’m listening to at the minute.